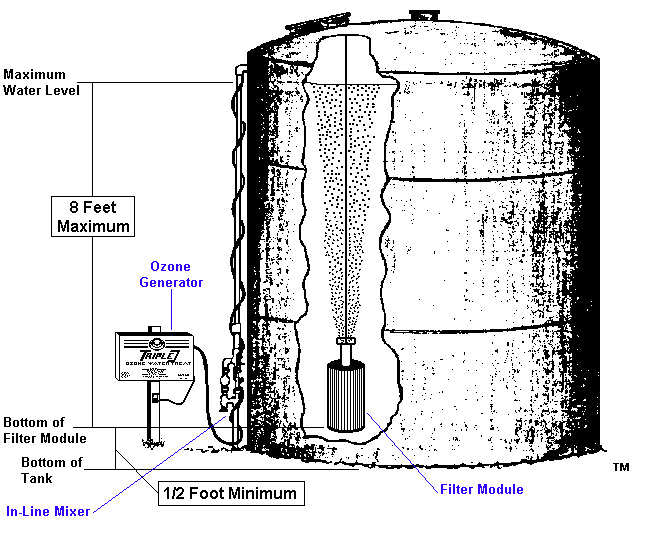 Patented chemical free ozone water treatment systems for use in atmospheric holding tanks. Each system can be used in a tank up to 10,000 gallons depending on the severity of the contaminants and the daily water usage. The system works on the concept of gallons per day and is independent of the gallons per minute flow rate. The important rule is that no more than 25% of the storage capacity should be used in a 24 hour period. Higher water usage could result in less than perfect water because the ozone needs contact time with the water to do its job, plus the water must pass through the in-tank filter multiple times. In order to calculate minimum tank size, multiply the maximum daily water usage times 4, although we recommend the tank size be as large as can be comfortably accommodated. The best buy tank size for a single home in the US is 2500 gallons which allows the homeowner to use up to about 600 gallons per day for average contaminants (iron to ~ 10 ppm, or manganese to ~1 ppm, or hydrogen sulfide to ~25 ppm, etc.) For severe contaminants (iron to ~50 ppm, etc) we recommend either twin storage tanks in series with a Tank Ozone System in each tank (preferred method), or a larger tank with multiple Tank Ozone System units. Big Brand Water Filter is an authorized Triple O distributor. All of our systems and parts are original Triple O. Many internet sellers are selling knock off systems and lamps, they do not perform as well as original. Ozone systems are used for oxidation of dissolved substances like iron, manganese and hydrogen sulfide in addition to being a powerful water disinfectant.